Jennifer is meeting with her best friend for coffee and support. She just found out that her fiancé Sam had a brief affair two years ago (and while they were dating). Even though Jennifer has seen proof that her fiancé ended the affair, she can’t seem to move past what happened. Now, every time she looks at Sam or hears him talk, she wonders what is the truth and what is a lie. When her fiancé admitted the affair, he said he was “sorry” and that he “regretted” the whole thing. But, his apology seemed forced to Jennifer. She feels like Sam wants to rush past his lying and affair and even pretend that none of it ever happened. To Jennifer, trust feels shattered because of Sam’s lying and cheating. She’s wondering if they should move ahead with their plans to get married in a month. Unfortunately, what Jennifer describes and is going through is an all too common occurrence in love relationships and marriages. The starting point for rebuilding trust is botched. The very important act of apologizing falls far short and leaves trust even more damaged than before. Whether it’s infidelity, lying or some other betrayal or mistake, when trust is damaged, it requires careful and conscious effort from BOTH people in the relationship to repair and rebuild it. Make sure that you apologize for what you did AND make sure that your apology counts. The apology is motivated by wanting to get out of trouble and move on instead of from true remorse. The apology feels insincere in some way. When your partner hears an apology that is insincere or comes from only guilt or your attempt to sidestep conflict, it’s not really an apology. 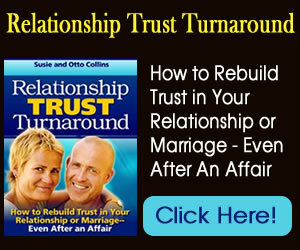 This will take you two further apart instead of beginning the process of moving you closer together again. When you apologize for anything to your partner, make sure that you really feel that apology first so that it will be authentic. If you feel justified in what you did, take some time to work with how you feel so that when you do apologize, a heart-felt “I’m sorry” is what comes through. Make sure your apology is backed up with an understanding of why you lied, cheated or did whatever you did that damaged trust. Be honest with yourself about what was behind your actions. Was it a need for connection, revenge, attention, affirmation that you’re still attractive, loneliness, anger and resentment or something completely different than these? This is not an inner inquiry meant to get you “off the hook.” It’s absolutely essential for you to own your decision to do whatever you did. But, in order to be clear in your apology and to avoid repeating past mistakes, know what motivated you to break trust. When you’re actually speaking your apology to your partner, don’t negate the power of “I’m sorry” with excuses or justifications. It could be true that there were extenuating circumstances that played a role in what you did. It could be that your partner’s words or actions were triggering to you and influenced your decision. You’re the one who chose to lie, cheat or otherwise break trust. When you apologize, just apologize. There will be time to talk about what contributed to your decision to do what you did. That’s important too. But, don’t apologize and then, in the next breath, list off your excuses to try to deflect blame. After you’ve made an apology that’s from the heart and that in which you take full ownership for what you did, then you can ask your partner to work with you to rebuild trust. Even though you are the one who broke trust, it’s almost always the case that dynamics in the relationship contributed to the disconnection that also damaged trust. Create agreements with your partner so that you can show him or her that you are changing and that you are trustable again. Create other agreements to address the habits that you two have that don’t serve your relationship and start developing new habits that WILL help you two re-connect. Last night my husband found out that i lied about how i broke my phone two years ago. I apologised straight away and explained that i was afraid of how he would react. He refused to talk to me, only asked me what else i had been lying about. I assured him nothing, which is the truth. I dont think he believed me, so i decided to just play it cool today and let him cool off. So its been a day and he still only answers direct questions, like how was work, etc, he only gives one word answers. So after dinner, he ate alone, iwent to him, i told him i was genuinely sorry, it was never my intention to hurt him and if he would like an explanation or to talk about it, i was happy to. He said no. Im not sure what to do now. I am going to see a counselor tomorrow, i know i have problems that contribute to our problems. Im just at a loss, i feel sick and alone. And i wish i could comfort him. Katie: Thank you for your post. We’re not sure what else is going on in your relationship, but we’re guessing that there’s been more beneath the surface that’s come between you and your husband– this is most likely not just about you lying about breaking your phone two years ago. You indicate that your “problems” have contributed to your relationship problems. It might be time to take an honest look at what those are. We suggest that you use the word “habits” instead of “problems.” There are habitual ways that you probably speak and act that might be part of what’s pushed your husband away from you. This might be lying about other things– even “little” lies. This might be the way that you interact with others or with him. Some of your usual habits are undoubtedly contributing to your husband giving you the cold shoulder. Of course, your husband also has habits– some of his habits also contribute to the conflict between you two right now. The good news is that you both can start now to change your habits and develop some new ones.